Are you looking for adorable maternity clothes but are on a budget? Me too. A friend told me about flybelly.com, I checked it out and quickly fell in love with the clothes! 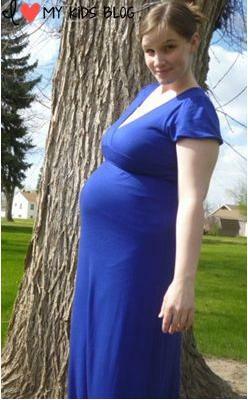 The majority of my maternity clothes have been through several pregnancies already and are over 8 years old. They are faded, worn, and never stay on properly. In a nutshell it has been a good 6 months since I have felt “beautiful” in any of my clothes. I miss feeling beautiful–and I shouldn’t have to give up feeling good about my looks for 9+ months! I found this GORGEOUS blue Stella Maxi Dress on Fly Belly and knew it was just what I needed to re-vamp confidence in myself. Isn’t it simply stunning? I was so excited to get this dress in the mail. The minute it arrived I took it out of it’s packaging and slipped it on. I looked in the mirror and couldn’t stop smiling. (I can’t even tell you how long it has been since I LOVED the way I looked!) I didn’t want to take it off even though I wasn’t going anywhere other than the kitchen to start dinner. As I was about to leave my room my 3 year old came in and was already mid sentence by the time she looked at me, stopped, and said, “Where did you get that dress? You look beautiful!” (Yes, she really does talk like that even at age 3–she has quite the vocabulary!) She insisted that I go show the other kids who were coloring pictures in the living room. I walked in and my other daughters seriously gasped when they saw me. I can’t even remember the last time I was gasped at in regards to looking good. I’ve spent the last 7 months being told how sick I looked (all those comments were very true)! It was such a nice change to hear something positive! My favorite reaction was from my husband when he came home from work, saw me, and said, “WOW! You look amazing! What a nice dress! You look so happy!” I was happy. The dress fit perfectly, it was a gorgeous color, was unbelievably comfortable, and I felt like a million bucks in it! The compliments didn’t stop there though. I wore this dress to church on Mother’s Day, there wasn’t one person I spoke to who didn’t compliment me on my stunning dress. 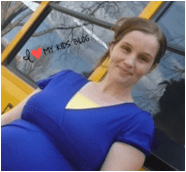 It is one of the most comfortable maternity clothes that I own, so I even wear it on my bus routes (yep, I am a super pregnant bus driver). I wore it today for yearbook picture day, they even include the bus drivers, how nice, and several of my students commented on how nice I looked. It just makes me feel so good to hear so many nice things! This dress was totally worth every penny! I feel GREAT in it! This maxi dress is made of 95% rayon and 5% spandex. It is super light weight and easy to wear. I used the fly belly size chart to choose the best size for me. I was thrilled with it’s fit. The best part is the v-neck this dress is going to be in my wardrobe well after my pregnancy is through, it will be perfect for nursing too! Then when I get my skinny body back (ha! Maybe in a year or 2) I am STILL going to be rocking this dress, it is just stunning! Fly Belly isn’t like you run of the mill maternity clothes website. It is run by one very nice lady named Liz. When you send an email-you get a response from a real person. When you place an order, she packages it and sends it to you. Her customer service is top notch and she has some seriously adorable clothes on her site! She recognized the need for adorable and affordable maternity clothes when she was pregnant with her 1st child, that is when she started finding maternity clothes and selling them on eBay. It was in 2010 she decided to jump into her dream and started flybelly.com! Liz is a stay at home/online working Mom of 5 kiddos. 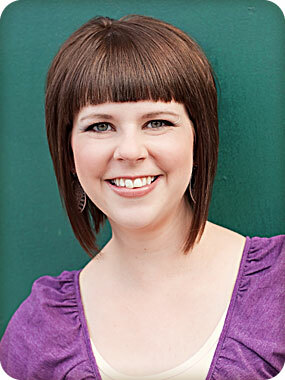 She has been married to her hubby Adam since 2002 and likes to play the flute, piano and organ for her church. She is an all around awesome lady from my experience with her and the site! Besides my beautiful maxi dress I quickly found several other items that I just LOVED! Here are a few. This adorable maternity clothes shirt! It has a nice sleeve length so my arms don’t look huge. Cute cinch ties on the side and a good length to it! 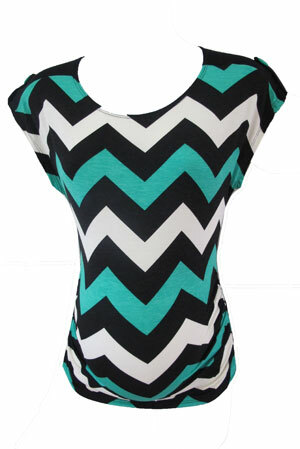 How about this adorable chevron top in jade, so cute, RIGHT? Another dress I LOVE is in the “Fly deal” section. I am loving this cute polka dot maternity dress for ONLY $24.00! $24–I did a quick google search on “polka dot maternity dress” and this dress from flybelly.com was half the price of the other polka dot dresses….AND it is adorable! Fly Belly has tons of maternity clothes like: tops, jeans, skirts, dresses, tanks, capris, shorts, and more. The prices are great and honestly you are worth it! It feels so GOOD to feel like you look good! You can follow Fly Belly on Facebook and Pinterest! You can also check out their awesome maternity clothes site HERE! Liz over at Fly Belly has offered to let me give one of my readers a $25 gift card to her site (You could score that super cute polka dot dress for free!) Want to be the winner? Just get as many or as few entries as you want on the form below…but make sure you get at least 1 in! This giveaway will end on 5/22 at 11:59 pm EST. It is open to US only. GOOD LUCK! Congrats to our winner: Sacha Schroeder, Sacha you have been emailed and have 24 hours to reply to it or a new winner will be chosen. thanks to all who entered and make sure you check out www.flybelly.com! Disclosure: I received the product mentioned above to facilitate in my review. Regardless of our arrangement I was not required to share a positive review. All opinions expressed above are my own. « Creamy One Pot Pasta Dinner Idea- Easy and Inexpensive! The Jersey Tee Shirt Dress in Navy is super cute! Lilly top or really any shirt super cute!!! I absolutely love everything that Fly Belly has!! And i’m kind of in love with the Evelyn Top in Owls! Super cute! Love that polka dot dress!!! Totally that polka dot dress! So cute! I’d get the polka dot dress! Super cute! the mint lace dress! love it! The amber and Lilly tops are super cute! Thanks!! I like the Colorful Chevron Maxi. Anything that is chevron is amazing to me! I love the Maria Dress very nice! I am loving that chevron top! I’m sold! I really like the tribal Maxi dress! I have found chevron yo be flattering on me in my larger state;) I do love polka dots though…tough choices as they are all beautifully designed with various body shapes in mind! I like the black and tan high low dress.